Celebrating Canada at 150: great, but where's our country gone? As Canada celebrates the long weekend I’m driving across the country. Back home the Canada Day fireworks show got rained out, so the town rescheduled them for the next day. I called my son to see how it went. He said it was OK, but there was no big finale this year. That somehow describes how the 150th celebration feels. I switched on the radio as I drove. The news was full of the aboriginal protests, the teepee on Parliament Hill, the observation that Canada is actually much older than 150 years, which is quite true. Just as human civilization is much older than European history. 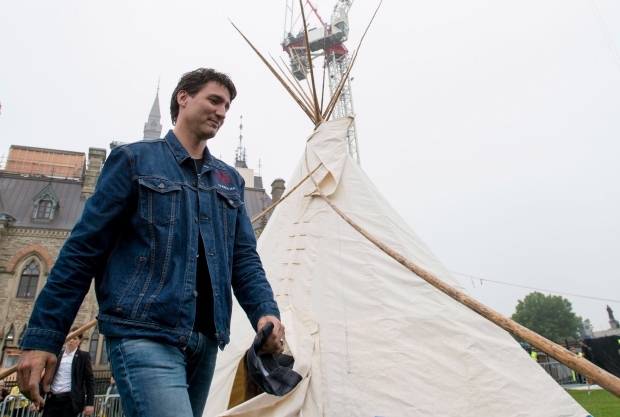 Justin Trudeau apparently stopped by the teepee for a news bite. He explained, lamely I thought, that “We have to move beyond the Indian Act, we have to end the Indian Act but we can’t do it with the stroke of the pen from Ottawa.” Well Justin, it’s been 150 years, which is pretty slow going. Not much of a vision there. Trudeau also appeared at another event, this one with actor-singer Tom Jackson, who told the audience that “the maple leaf is my sister,” and gave them the count of five to imagine him as their/our brother, as Justin and wife Sophie looked earnest and wiped away tears. It was one of the most sentimentally maudlin displays I’ve seen in a while, conveying far more embarrassment than pride in being Canadian. But is certainly maintained the present path of selfie politics, lining up perfectly with a $500 million government “investment” in the 150th celebration that will leave little if any lasting legacy. My mind reaches back to 1967, our centennial year, and Expo year in Montreal. Even accounting for my youth and enthusiasm at the time, the country still seems to have been far more optimistic then. Canada was getting a sense of itself as a complete country. The two solitudes, French and English were beginning to see each other as separate but complementary cultures, each contributing to the Canadian culture. The FLQ and separatism, not without some violence and terror, were fuelling the concept of Quebec as a distinct culture worth preserving. Native art and culture was on an upswing. And Expo itself, spread across two manmade islands was a brilliant showcase for Canadian art, design and innovation. It seemed like, after 100 years, the real Canada had just been born. So what happened? As I drive across rural Canada not a lot seems to have changed. The cars and trucks are flashier. The main highways, for the most part, are better. But the landscape tells the story. In between the vast stretches the lumber and pulp mills, the mine head frames, the industrial-sized farms, the farm equipment sales lots show how Canadians make their money: from the land. We are still very much hewers of wood and drawers of water. The cities, most of which have busy bypass roads, are filled with office towers and strip malls, processing and administering the profits from our resource industries. If you don’t believe me, just think about what happens to Canada when the price of oil drops, or when the US slaps another tax on softwood lumber. What I really see as I drive is still very much a resource provider for the US. I get another reminder of that as I pass Bomarc Road just outside North Bay. The road is named for the missile that replaced the Avro Arrow, the zenith of Canada’s aerospace industry in the 1950s, killed by Diefenbaker in 1959. The Bomarcs were never used of course, and much of the Arrow’s innovation talent was exported south of the border, some of it to NASA for the moon mission. Despite the Arrow’s demise, the plane proved to Canadians and the world that Canada was a hi-tech contender. Today, Canada’s military role is even more indexed into the US–NATO world agenda. We’re on the ground in Afghanistan and Iraq. We’re lending support in Syria. We have troops in the Ukraine. Together with the Americans and NATO we’re sabre-rattling with Russia. Gone are the days of small, independent Canadian peacekeeping. Gone are the days when a prime minister (Pearson) would deliver a scathing speech on war to the the Americans. Today’s Canada has been moulded more by pro-business trade deals than Canadian national aspirations. Think Mulroney and NAFTA. Deregulators like Paul Martin. Oil patch-friendly Harper, and now Trudeau II. For curiosity I looked up and old CBC/This Hour Has Seven Days interview with Réne Lévesque and a young Pierre Trudeau. They actually spoke candidly, openly about Canadian issues. “Are you a separatist or not, Mr. Lévesque?” It wasn’t scripted, it was honest and real. They were groping to find something: a uniquely Canadian vision. And for a few brief years, we almost found one.